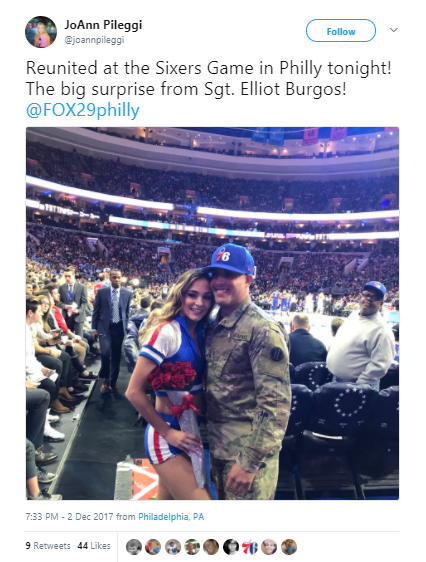 On Saturday night, an American soldier returned home and surprised his girlfriend, a Philadelphia 76ers dancer, after the first quarter of the basketball team’s game. U.S. Army Sgt. Elliot Burgos had just returned home from an 11-month deployment in Kuwait and Jordan on Nov. 29. However, for the last three months Burgos had been planning to make a big reunion for his girlfriend, Angela Destasio. “He told me he was all set to come back to Texas on Tuesday, and I was watching the video and said ‘Oh my God, that’s my boyfriend,'” Destasio told Fox 29. Burgos convinced Destasio that he was still in Kuwait by talking to her at times that he would talk to her if he were in Kuwait. “There’s not many people who can surprise a loved one in front of 20,000 people, so I’m a lucky man,” Burgos said. Burgos said that his plans to surprise his girlfriend were almost ruined when he ran into someone who knew him at the airport and wanted to post about it on social media. “As soon as I got into the terminal in Newark, I ran into someone I knew, and right away he wanted to put me up on social media and I’m like ‘No no no no no,’” he told Fox 29. The two plan on spending time together during the holiday season.